Have you ever heard of Double Six Beach? 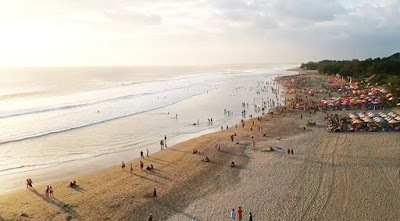 This beach is located in Seminyak, Bali. Its position is not too far from Kuta, only 2-3 km away. Reportedly, there is a nightclub in this area called Double Six, well, since then, this beach has been called the Double Six beach. On the Double Six, many beach umbrellas and beautiful benches scattered about. Colorful adds to the beauty of the scenery (usually there is a rental). Double Six has beautiful views of beaches like other beaches in Bali. White sand, clear blue water. There are quite a lot of activities that you can do on this beach, including swimming, horse riding and surfing. If you don't bring equipment, rental services are available here and if you want to practice, there are also instructors. In addition, you can also try the body board. Want to try another? Here you can also try Bungy Jump. This location is perfect for those of you who like to take pictures. Guaranteed, this photo will be cool 'perch' on your social media account. To be sure, the Double Six club is an icon on this beach, so those who visit this beach, most will enjoy the music boom at night clubs. And the atmosphere will be more crowded at night.